In late 2013, Ayano Takeda’s second novel, Sound! 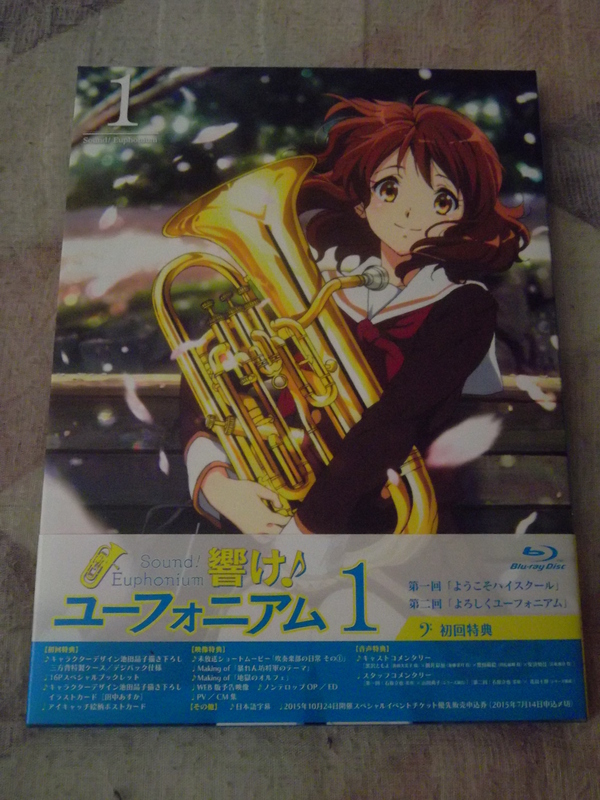 Euphonium, was published by Takarajimasha under their paperback label. It was read by two producers at Kyoto Animation who instantly knew that they wanted their studio to adapt it into an anime production. In autumn 2014, Takarajimasha announced the anime adaptation and at Comiket 87, the first promotional video announcing it was to be adapted by KyoAni was revealed. 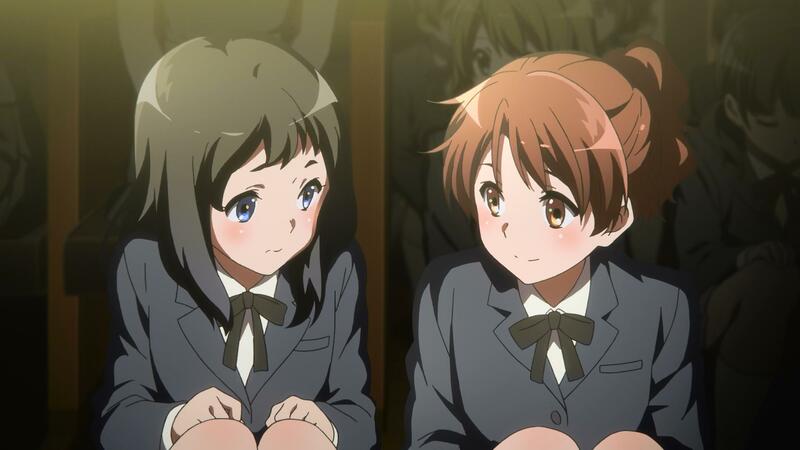 Simultaneously, Takarajimasha took the publicity opportunity to publish 3 sequel novels to Euphonium in early 2015. The show was a success and KyoAni wanted to adapt more in a sequel. After maintaining interest in the franchise with a recap film in April 2016, the second season is set to air from October to December 2016. Last year, I wrote a primer on what to expect from Sound! Euphonium, having read the novel prior to broadcast. This year, I wanted to write a review of what happened previously and what to expect in the second season. The first Sound! Euphonium novel introduces us to the story’s protagonist, Kumiko Oumae. 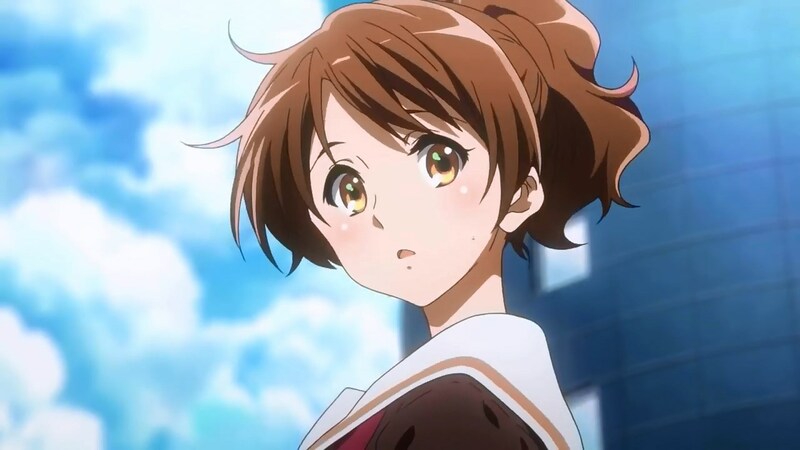 Kumiko had a couple of traumatic events in middle school, concluding with her school’s concert band earning gold in the Kyoto Prefectural Competition, but not moving onward to the Kansai Competition. While Kumiko was happy they earned gold, her acquaintance, Reina Kousaka, was frustrated beyond belief since their path was stopped. 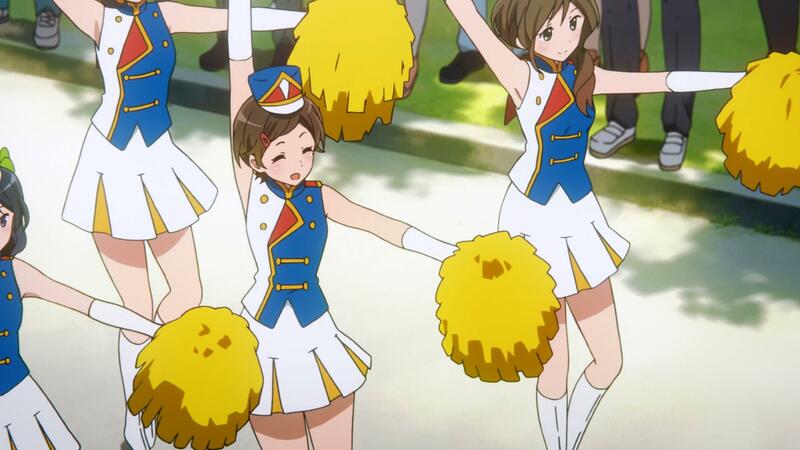 Kumiko questioned if Reina thought they would go to Nationals and Reina got upset. 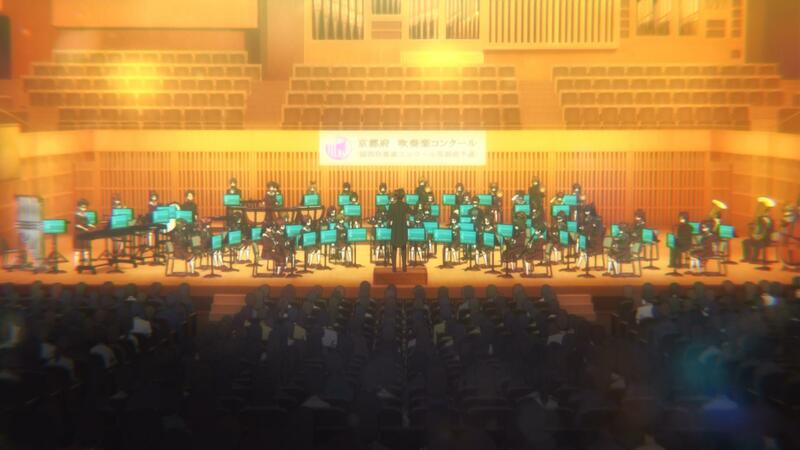 Due to that, Kumiko chose to go to North Uji, a school not known for its concert band, mostly due to their uniform. At North Uji, Kumiko meets Hazuki Katou and Sapphire Kawashima (just call her Midori) in her class. Hazuki and Sapphire want to join the concert band, but Kumiko remains timid, especially when Reina comes in and instantly joins it. 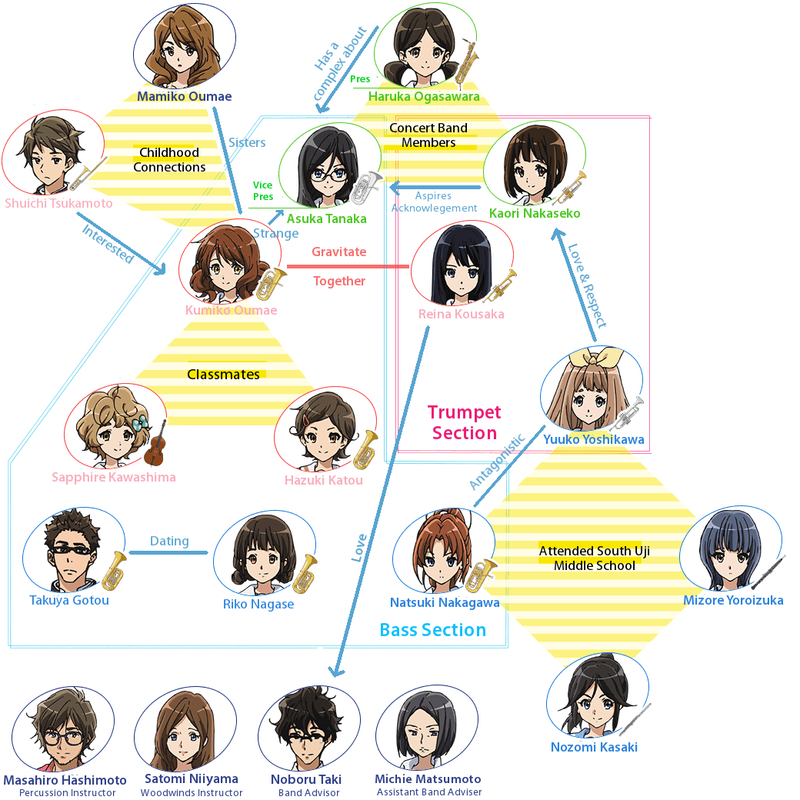 Kumiko dwells, but eventually joins it and ends up playing the euphonium yet again. The concert band is heavily disjointed at first, but after instruction from their new advisor, Noboru Taki, they steadily improve daily. After a round of practicing, they perform at the Sunrise Festival, capturing some attention away from the nationally-known Rikka High School Marching Band. After Sunrise, Taki announces that auditions to perform at the Kyoto Prefectural Competition will be held soon and to practice their parts. Kumiko’s other traumatic event was when she was chosen to perform as an underclassman in middle school over one of her seniors. Kumiko practices and fears a result where she’s chosen over her second-year senior, Natsuki Nakagawa. During this period of strife, Kumiko is suddenly asked if she likes her childhood friend, Shuichi Tsukamoto, since Hazuki is crushing on him. Trying to avoid the love triangle, since she doesn’t have feelings for him, Kumiko chooses to go to the Agata Festival with the next girl that walks out of the clubroom: Reina Kousaka. Reina chooses to climb up Mt. Daikichi instead of attending the festival itself. She compliments how Kumiko always says the truth of what’s on her mind and explains how she wants to be special. This inspires Kumiko to practice more and improve herself. Both are chosen to play in the Kyoto Competition with Reina winning the trumpet solo over the third year part leader Kaori Nagaseko. A rumor starts going around that Reina personally knew Taki before he was employed at North Uji, which frustrates Reina. 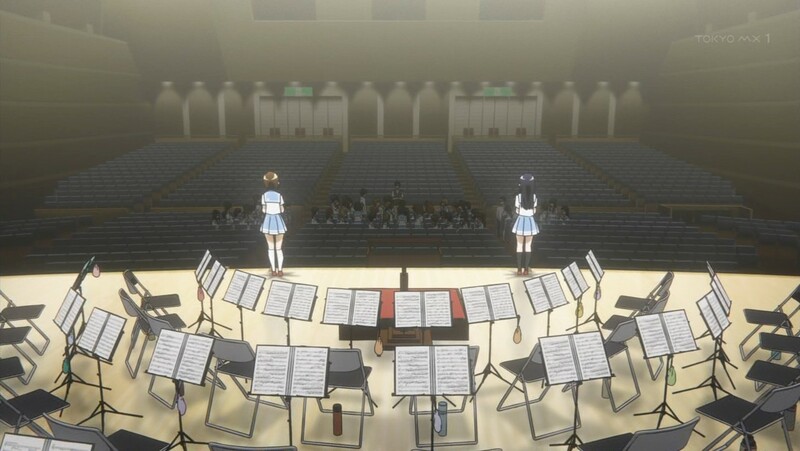 Kumiko remains by her side and gives her strength through a second audition in front of the band before the Competition. The result is the same: Reina will perform the solo. As the Competition comes closer, Taki revises the score so that the euphoniums will double Sapphire’s contrabass on a section. While the more talented Asuka is able to play that section easily, Kumiko continues to struggle until she is told not to play that section by Taki. Frustrated, Kumiko finally realizes how Reina felt in middle school. She takes that determination not to fail to the Competition alongside everyone else’s renewed spirits. In the end, North Uji was one of the three schools chosen to move forward to the Kansai Competition. And so the next piece begins…. Sound! Euphonium 2 begins right where we left off: the results of the Kyoto Competition. We get information about when the Kansai Competition will occur and plans for practicing for it. In an effort to improve herself, Kumiko decides to head to school to practice alongside Reina, meeting at the station at 05:00 each morning. When they arrive, a second-year is already there: Mizore Yoroizuka, who plays the oboe. 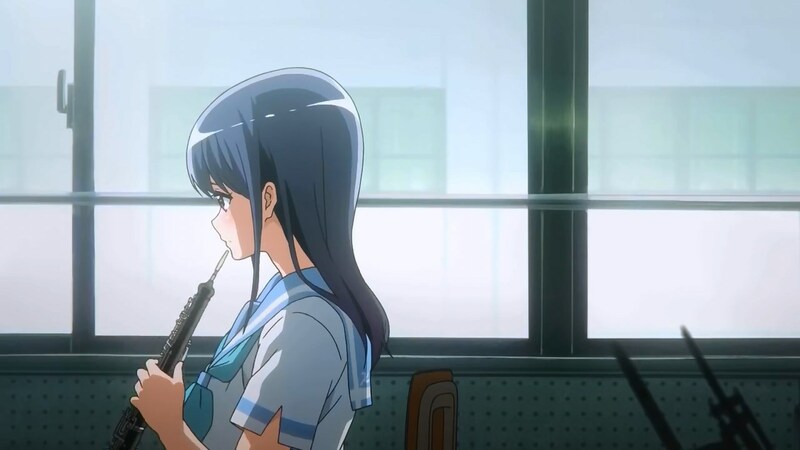 Mizore’s tale involving her former friend, the former flute player Nozomi Kasaki, will be a big part of this upcoming season. Out of the 28 schools that participate in the yearly Kyoto Competitions, only 3 move forward. In the Kansai region (one of Japan’s most densely populated areas) there are eight other prefectures with a number of participants similar to the amount of schools that participated in Kyoto’s competition. Only the best 20 schools from those 8 other regions moved on to the Kansai Competition like North Uji, Rikka, and the unnamed Kyoto representative did and so the level of the field grew that much higher this time around. The scope of these competitions is quite vast, and to survive even one round of culling is a major feat. Now there’s 22 other schools each vying to be one of the three that move to the All Japan Band Competition. In other words, North Uji has to be one of the top three schools in the entire Kansai region in order to attend Nationals. There’s three huge problems standing in their way: Myoujyou Engineering High School (MyouKou), Osaka Toushou High School, and Shuutou University Affiliated High School (ShuuDai Fuzoku). Those three schools have been at the top of the participating schools in the Kansai region for some time. If North Uji is to go to Nationals, they have to not only beat 19 other schools as talented or greater than they were at Kyoto, but they also have to dethrone one of the “top three.” Making it to Kansai was difficult, but doable. Making it to Nationals against this competition requires a miracle. So in order to create this miracle, Taki calls upon his college friends: Masahiro Hashimoto and Satomi Niiyama. Hashimoto will help instruct the percussion section while Niiyama will help instruct the woodwinds. Taki will handle brass by himself. This allows each section to improve simultaneously. 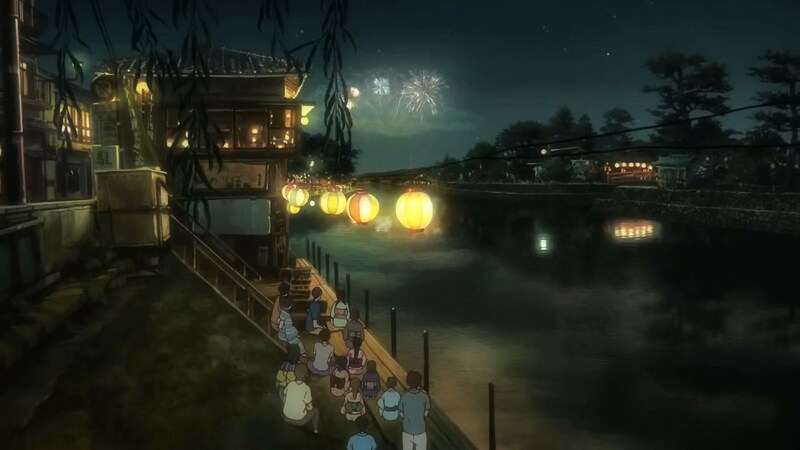 Beyond that, season 2 will feature the Uji Fireworks Festival (which hasn’t happened in real life for the past couple of years), an outing by the four first year girls to a local pool, and more information regarding the two assisting characters people are most interested in: Asuka and Taki. 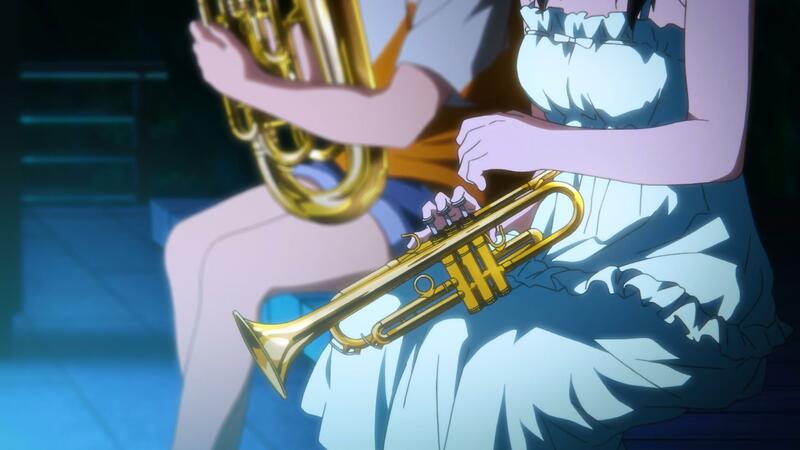 Why does Asuka play the euphonium? Why did Taki become an advisor at such a young age? We’ll find out! Will North Uji pull off the miracle and make it to Nationals? Will they survive their “Hottest Summer” and “Biggest Crisis”? What will happen with Kumiko and her friends? Also, what’s going on with Kumiko’s sister, Mamiko? Will they all reach Heaven…..or will they fall to Hell? Find out in….. Sound! Euphonium 2! In 2013, Ayano Takeda wrote a novel based on her and her friends’ experiences in concert band/wind music called Sound! Euphonium: Welcome to the North Uji High School Concert Band. This was her second novel published after she won the Japan Love Novel award for her manuscript Today, We Breathed Together. 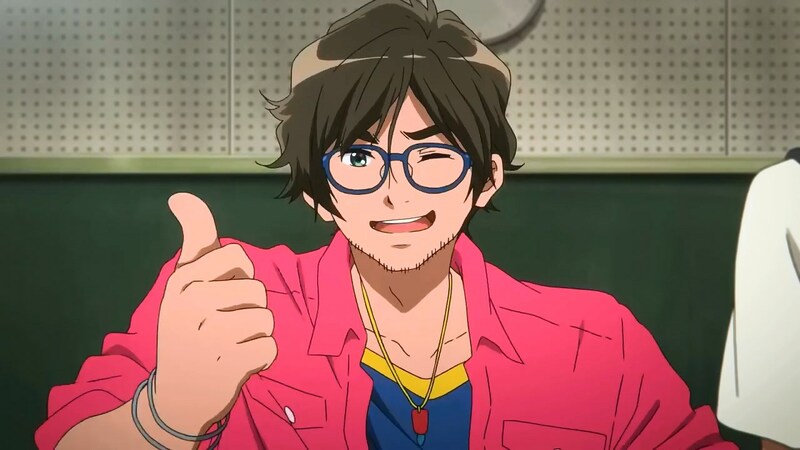 Takeda’s novel caught the attention of two producers at Kyoto Animation (Eiharu Oohashi and Riri Senami). They approached the publisher for the rights to adapt it into an anime and, after partnering with Pony Canyon, Lantis, and Rakuonsha, they began airing it in April 2015. This review covers the first Japanese Blu-ray volume of the show published by Kyoto Animation and the Hibike Production Partners.